Designed for freeriding and built to last. As well as providing protection against wet and chill, the Hagl�fs Women's Khione Pants are breathable enough for even the most intense activity. First things first: the two-layer Gore-Tex fabric used in these trousers protects you from anything the freeride weather might throw at you. And it's constructed to be both soft to the touch, providing an extra level of comfort while you're active, and breathable, meaning that the only discomfort you might feel from your exertions is muscle ache. 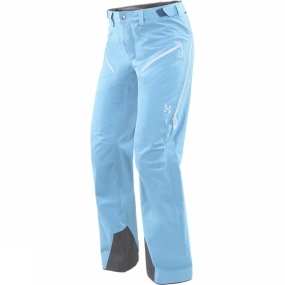 The seat and waistband are lined with brushed tricot for comfort, while the insteps and snow gaiter are reinforced. These trousers are soft, and strong. Silicone augmentation in the lower leg gaiters keep them in place when you're moving, while zipped vents in the legs allow you to control your temperature. Thigh pockets are angled so as to provide easy access, and zipped for security. Finally, easy adjustability - including a hook and loop-adjustable waistband - takes the time out of mid-activity tweaks.